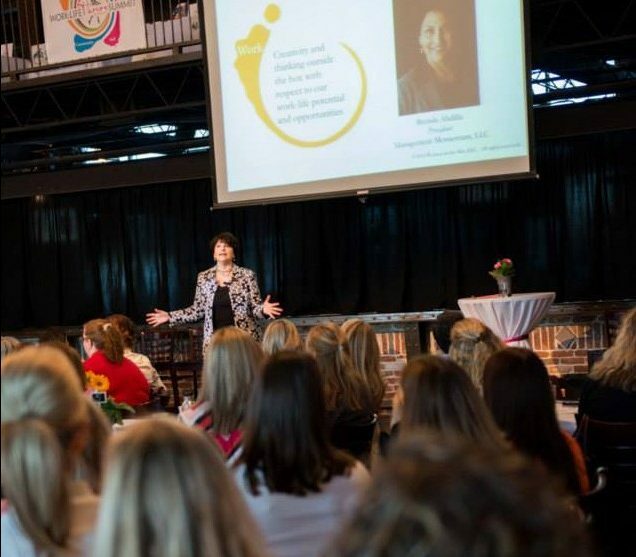 Book Brenda to speak at your company event, association meeting or important conference. Brenda’s workshops and break-out sessions inspire participants to organize their thinking differently when it comes to stress, productivity, goal setting, vision, taking action, personal leadership and creating a functional team that gets results. You can take the next step by checking her availability. Just click on the link to the right. Someone on our team will get back with you right away. Clarity and Confidence for your Best 2016! Don’t manage your time – Rehab It! An accelerated GOAL achievement method for busy professionals. forget about S.M.A.R.T. goal setting and instead, use your subconscious mind to your advantage. In this interactive workshop participants will learn to move the concept of leadership from an ethereal concept to a practical, tangible that can be measured and improved. Featuring the ED DiSC Workplace Assessment and Report—plus ED.Com membership. The purpose of this workshop is to deepen the team experience of the business. If you are ready to feel like you have more control over your life and work especially ready to live a life that is of much more of your choosing then this workshop is for you. Brenda can also customize a program for your group featuring a powerful personality test or assessment. See our assessments page to choose and assessment. I appreciated the opportunity to learn some valuable tips for my career development and advancement as well as the chance to meet other people and practice my networking. I realize how far I have come and thank you for helping me to see my career in a whole new light. Just wanted to thank you again for the wonderful workshop on Confidence for Women! I got so much out of it! And the EQ Test is so right on, it's scary! So many helpful tips. Brenda’s workshop was enlightening and educational! It helped me by unlocking my potential, and making me look at my professional and personal challenges in new ways. By emphasizing attaining small improvements first to build momentum, I realize it will lead to larger changes! I found Brenda’s workshop informative and realistic! I realized that I need to SLOW down and take step back. I am encouraged to prioritize my life. Brenda gave me manageable tools, which were simply explained. I realized that I need to keep things chunked down into smaller bites. Having done years of work with a life coach; Brenda’s session acted as a reminder for me to focus on the positive by focusing on small changes and not jumping into big ones. Brenda’s workshop was motivating and uplifting. A must-do for everyone! Brenda helps you to slow down and really think about what you want, then she helps you develop the steps you need to get it! Because of Brenda’s workshop, I now take the time to pause every day to think about my goals both consciously and subconsciously. Brenda gave me applicable tools I need to make both business and personal plans! I am very thankful!